Once that first snow hits the ground, drivers across the state swear their fellow motorists have forgotten the basic rules of the road, let alone how to drive in winter weather. To emphasize safe driving through the winter season, PennDOT's Winter Driving Awareness Week will be observed Jan. 7-13, 2018. To help you regain your confidence on snow-covered roads, or simply as a refresher for what you already know, here are some frequently asked questions on winter driving safety. First and foremost, though, SLOW DOWN and increase your following distance. Last winter in Pennsylvania, preliminary data shows there were 252 crashes resulting in 129 injuries on snowy, slushy, or ice-covered roadways where aggressive-driving behaviors were factors. How can I check my vehicle before winter weather hits to make sure it's ready? What should I include in a winter emergency travel kit? Where can I go to find out what my roads are like during a storm? Do I have to remove ALL the snow and ice from my vehicle? Can I leave my car unattended while it warms up in the driveway? What should I do if I encounter a snow plow on the road? What should I do if I become stranded in the snow? Your heater and defroster are working properly. Your vehicle's radio is working so you can receive weather and traffic reports. Tires are properly inflated and have sufficient tread depth. Additionally, if you live in an area prone to heavy snow, you may want to use dedicated snow tires or carry a set of tire chains. You should also have a mechanic check the brakes, battery, hoses, and belts. PennDOT encourages the use of 511PA.com to check the roads before you leave. On the site, motorists can check conditions on more than 40,000 roadway miles, including color-coded winter conditions on 2,900 miles. 511PA is free and available 24 hours a day. It also provided traffic delay warnings, weather forecasts, traffic speed information, and access to more than 850 traffic cameras. During a storm, users also can check 511PA to track snow plows and see when their local roads were last plowed. Additionally, you can now check travel alerts along a specific route using the "Check My Route" tool. Yes. It is illegal to drive with snow and ice obstructing your vision through the front, side, or rear windows. Additionally, if snow or ice dislodges or falls from a moving vehicle and strikes another driver or pedestrian causing serious bodily injury or death, the driver faces a fine of no less than $200 and as high as $1,000. As long as your car is on private property – like your driveway – you may leave it unattended while it warms up. However, in Pennsylvania, it is illegal to leave a running car unattended while on public property. Be alert since plow trucks generally travel much slower than other traffic. If a plow truck is traveling toward you, move as far away from the center of the road as is safely possible. Remember that snow can obscure the actual snow plow width, which is wider than the truck. Never try to pass or get between several trucks plowing side by side in a "plow train." Never travel next to a plow truck since there are blind spots where they operator can't see. Keep your lights on to help the operator better see your vehicle. And remember, it's that law that if your wipers are on, your headlights must be on. Before you drive during a winter storm, make sure someone else knows where you are going and when you expect to arrive. In case you run into an emergency and need help, someone will know where to look for you. If you have a working cellphone, call 911 immediately to get assistance. It's better to stay with your vehicle until help arrives. Run the engine every hour or so, but make sure the tailpipe is clear and keep the downwind window cracked open. 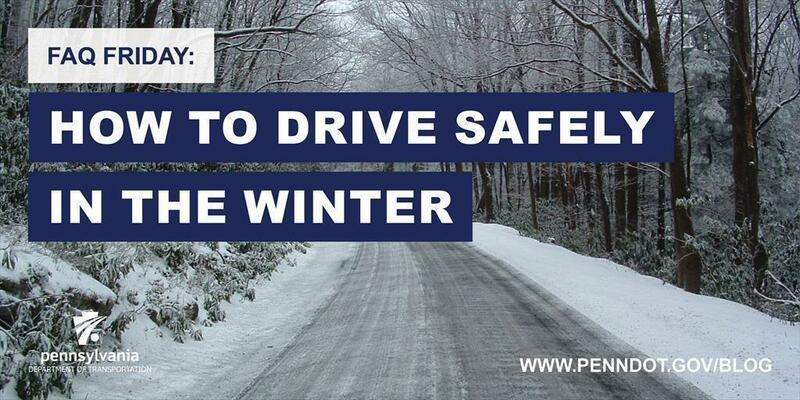 For more information on safe winter travel, an emergency kit checklist, and information on PennDOT's winter operations including a video, visit www.PennDOT.gov/winter. Additional winter driving and other highway safety information is available at www.PennDOT.gov/safety. Follow the conversation by using #PAWinter on Twitter and like the department on Facebook.